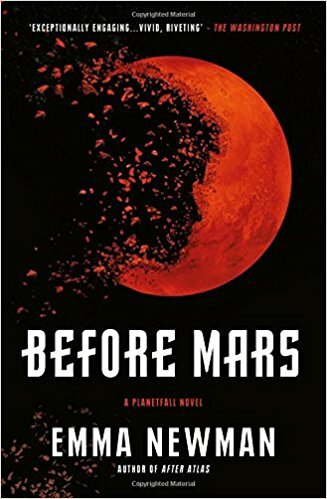 Before Mars is the third in Newman’s ‘Planetfall’ series, following Planetfall and After Atlas. Newman is multi-talented: co-writer and co-host of podcast “Tea and Jeopardy”, writer, narrator, and designer-dressmaker (makes a person feel quite inadequate!). Not having read the first two books in the series, I was nervous about Before Mars, after my Loki experience, but I needn’t have worried. Newman makes the book easy to read and follow for new readers and the exposition didn’t feel clunky or unnatural for those who’ve read the first two novels. The story centres around Anna Kubrin and her stay at the research base ‘Principia’ on Mars; she is a geologist and artist, sent to join a team already at the base. The novel’s central theme is memory and reality: What is real? Are these memories genuine? Who can I believe? The initial doubt is sown when Anna finds a ‘Memento’ style note to herself in her new quarters and this is compounded by her fears of ‘immersion psychosis’, worries about unstable mental health from her own past and the uncertainty of her feelings towards both her new colleagues and the family she has left behind on Earth. Is she paranoid, or are they really out to get her?! The novel is a brilliant mixture of mystery, psychology and fantasy science. As someone completely unversed in science, the technicalities of life on Mars and the use of AI were fascinating and utterly convincing. The exploration of memories and truth, madness and lies, is well-handled and felt so real I would guess it’s based on real-life experience of anxiety and/or depression. 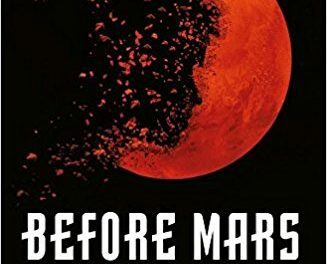 We never actually find out when Before Mars is set – there is reference to a collapse of diplomacy “in the 30s” but I am not sure if this refers to the 1930s and we’re reading about a parallel history or the 2030s and we’re living in the far future. For the sake of the story, it doesn’t really matter, but if the second case is so, gender politics, gender roles, and expectations of women as mothers hasn’t moved on as far as space-travel! 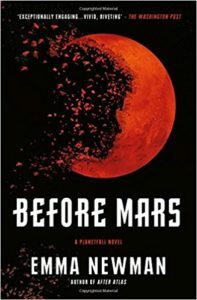 An interesting non-narrative element in Before Mars is Newman’s exploration of Anna’s relationship with her child – she is not a ‘natural’ mother, and clearly suffered with post-natal depression; her mixed feelings about their lack of attachment – from rationalisation through justification to crippling guilt and back again – recur throughout the novel. It does make a change to read about a mother who doesn’t feel maternal but, even in a time where people live on Mars, Anna is made to feel unusual in her desire to keep herself interested in the “real world” and let her husband be the primary carer for their daughter. Sigh. As an aside, I also found it interesting that, in Newman’s world, people still value art and have pets, despite water, food and living space being at a premium. Living in a world of restricted space and restricted nutrition, would you really take on a dog or two cats … ? The ‘reveal’, explaining what is truth and what is not, is not a big surprise – clues are left for you throughout – but the denouement is nevertheless tense and well-handled, leaving the series open for further instalments. 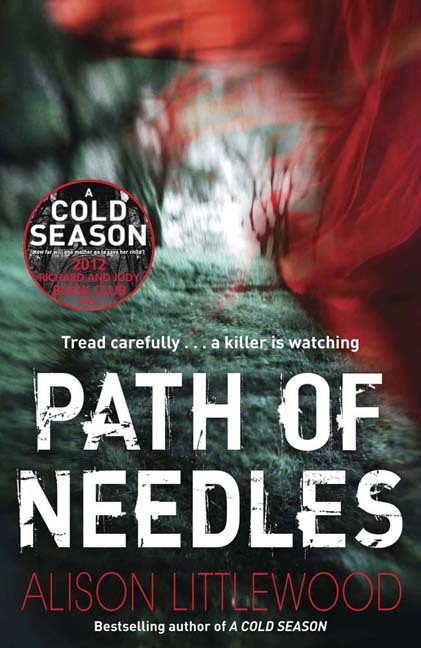 I very much enjoyed this novel and hope to read the first two books in the series; I have also subscribed to Newman’s podcast! Definitely recommend.